Voice-First. The rapid growth of the market for voice-enabled technologies, sparked by the popularity of the Amazon Echo, has the potential to be as disruptive a technology change as any that preceded it. Some are describing this new trend for devices and software is known as Voice-First, that is, the primary interface to the technology is spoken. These offerings are found within hardware, some of which is designed to include Smart Home features. Examples include the ‘smart speaker’ Amazon Echo product line, Google Home, and in 2018, Apple HomePod. And Voice-First is built into software such as new smart, personal, digital, and virtual assistants. Note examples that are part of platform ecosystems: Alexa, Siri, Cortana, Samsung’s Bixby, and Google Assistant. The category also includes voice interaction with devices as disparate as wearables, tablets, security alarms, healthcare interactions, and cars. Since this is an early, even Version 1.1 market, many more Voice-First examples are forthcoming, maybe even next week! Voice-First for Boomer-Senior Markets. In the boomer-senior segments, hardware has emerged with Voice-First interfaces, including LifePod and Nucleus Life. In addition, software add-ons multiply, including the Amazon Skills library of 26,000 (as of November, 2017), including Orbita Engage for Care Coordination. AskMarvee has introduced a training program called Aging with Alexa to help caregivers and older adults familiarize themselves with the technology. Voice-First technology, with its natural language interface and AI underpinnings, can understand spoken requests and commands in multiple languages --Apple’s Siri supports multiple languages and countries. How can Voice First Help Older Adults – now and in the future? Voice-First technology is used to answer questions, play music, read books aloud, interact with network-connecte d devices and offer scheduled alerts. As of November, 2017, Amazon has sold more than 20 million of these devices. Product features are regularly added via the cloud, eliminating the requirement for user-dependent software upgrades – and perhaps even the initial startup that requires a smartphone. For example, customization for specific voices, nesting queries within a context, or setting topic-specific timers or alarms. But are each of these features simply that – features? Is there a larger offering, perhaps for use in managing personal environments, that will be useful for individuals with hearing, vision or mobility limitations? Perhaps changing the communication paradigm in senior living environments? 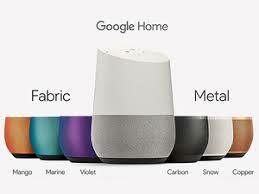 Or with family members – what does it mean to 'Drop In' on an older adult via one of these Voice-First devices? This week marks the launch of this research effort. Beyond previous aggregation of offerings, this topic needs exploring over the coming months – and interviews with experts are being scheduled. Is Voice-First engagement and its underpinning of AI really an improvement – or is it a distraction for older adults? Can providers who offer additional skills and services through Voice-First interfaces make money? Is there a smooth sequencing of interactions begun as Voice-First and continuing in another domain, for example, interactions about health-related appointments and schedules? What are the limitations of Voice-First? What is the potential for misunderstanding and miscommunication about or with older adults? And what other aspects of the topic would you want to see covered in this research? Your thoughts welcome. Permalink Submitted by Mike Bice (not verified) on Tue, 11/28/2017 - 07:48. Will Voice First overcome the "bundling" deficits of single purpose devices? Is Voice First a more private and secure vehicle for seniors? Will such Voice instruments as Echo Show become a vehicle for telemedicine? Voice proponents claim the devices will lead to and ensure patient engagement-but will they? Is there evidence to support the patient engagement claims? What are the critical success factors for a voice vendor's success? Permalink Submitted by seniorhousingtech (not verified) on Tue, 11/28/2017 - 08:24. AI is the major player of future tech as the industry progresses, the ease of use of any particular tech based on Voice activation and as the age progresses the voice of a person is the last thing to get affected. Voice First will provide major help to senior citizens for everyday activity -- they will not need not to be dependent on anyone. Permalink Submitted by John Brandt (not verified) on Tue, 11/28/2017 - 11:54. It seems "Voice First" technology would be ideal in helping with medication management for seniors (and others). Issues related to reminders as well as other monitoring techniques could be very helpful. A quick review of "skills" in Amazon Echo revealed basically nothing in this area. Anyone know of any resources? Permalink Submitted by Britney McKay (not verified) on Mon, 01/08/2018 - 13:08. Check out Tricella or other smart pill boxes- there are a few on the market. I have no personal experience with them, but am aware of their existence. I would imagine they could integrate, if they don't already, with voice first products. Permalink Submitted by Laurie Orlov on Tue, 11/28/2017 - 13:44. I am delighted to have the chance to express myself..I will be 92 in Feb..I live alone & still handle my business connection (I.m a retired Realtor) I have hearing & sight problems but am getting around fine.. Why is all of the interest in falling about after the fall?? when obviously the fall should be prevented...the tech is already available with some modifications..I envision a belt or vest using blow=up supports (airbags, furniture,etc) anti tipping tech...easy/peasy..small children have devices for this purpose...why don't seniors...TALK ABOUT A MONEYMAKER/SAVER. Permalink Submitted by Laurie Orlov on Thu, 11/30/2017 - 07:27. It would be wonderful to learn more about the regulations surrounding the use of voice-enabled technologies when they are related to health. This area is evolving and I suspect a number of companies are waiting in the wings for more info related to what information can and should managed by a voice-based solution.